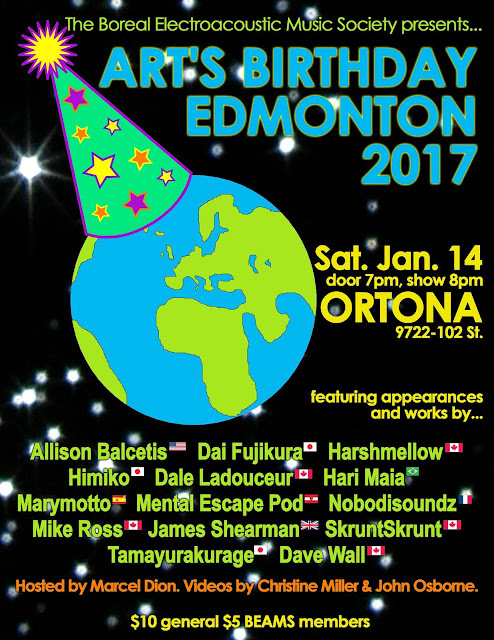 As part of an international celebration created by French artist Robert Filiou in 1962, the Boreal Electroacoustic Music Society presents ART'S BIRTHDAY EDMONTON 2017. ...performing and/or improvising works by international composers Dai Fujikura (JPN), Hari Maia (BRA), Marymotto (SPA), Mental Escape Pod (AUT), Nobodisoundz (FRA), James Shearman (GBR) and Tamayurakurage (JPN). Tickets $10 ($5 BEAMS members) available at the door.